Merkaba means the spirit/body surrounded by counter-rotating fields of light, (wheels within wheels), spirals of energy, which transports spirit/body from one dimension to another. It is portrayed as two equally sized interconnected tetrahedrons of light with a common center, where one tetrahedron points up and the other down. 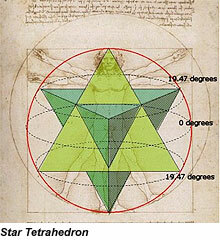 This point symmetric form is called a stella octangula or star tetrahedron. Mer-ka-ba is actually three words, not one. Mer means 'light,' that rotated within itself. Ka means 'spirit,' referring to the human spirit. And Ba means the 'human body' - though it also could mean the concept of Reality that spirit holds. Ancient Egypt refers to merkaba as a rotating light that would take the spirit and the body from one world into another.